GREEN BAY, Wis. -- It's one of the most unique training camp traditions in the NFL: Green Bay Packers players riding local kids' bicycles from Lambeau Field to the practice field across the street. This year, it took on a special twist for one Packers rookie. On the second day of practice, center Corey Linsley was asked by a boy named Travis if he would choose his bicycle. Linsley agreed. "I was just trying to make conversation with him because he's probably like, 'Do I really want to talk to this guy?'" Linsley said. 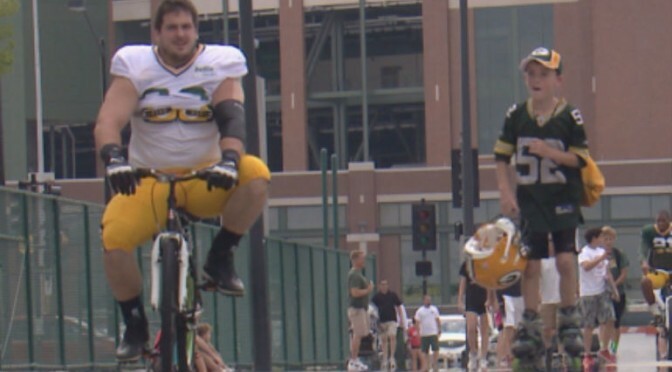 Since then, Linsley has been exclusively riding Travis' bike to practice every day. During those short rides, Linsley found out that Travis' mother was in the hospital. It was clear to Linsley that Travis didn't even understand "the depth of the situation" with his mother; a medical situation that Linsley wouldn't discuss with reporters. On their fifth ride together, Linsley asked Travis for his father's phone number. The two of them arranged for Linsley to pick up Travis and surprise him with a gift. "I was just like, you know, I'll befriend this kid and see how much I can help out," Linsley said. "I figured buying a bike would be appropriate for the situation." When they got to the first bicycle shop, Travis picked one out right away. Linsley noted that there wasn't a lot to choose from and encouraged Travis to check out another store: Toys "R" Us. So they drove there, where Travis found the perfect bicycle. "He's been riding it, I'm sure nonstop," Linsley said. "He took off as soon as we got it back to the house." Linsley will get his first chance to ride the bicycle himself on his way out to Monday night's practice. "I'm excited to ride it too, I guess," Linsley said. Linsley could tell from the first time he met Travis that the two of them were a lot alike at that age. "As a kid, I remember looking up to people in general, and anything they could do to help me out, I took that to heart," Linsley said. "Anybody who lent out a helping hand to me was just the greatest thing in the world. I figured he was the same way. He seems a lot like I was. I was a ball of energy, couldn't control me. So I knew he'd appreciate that. So that's why I did that." Linsley didn't do it for the media attention. He was a bit disappointed that the story got out at all. But as he competes to be the Packers' starting center -- a job that will be difficult for him to win against JC Tretter, Linsley knew there were other things he could do with his time and money. "It definitely takes your mind off of the stress and the stuff that goes on here and really grounds you a lot and brings you back to reality," Linsley said. "There's still people that look up to you no matter what."